I think there is a very special melancholy that comes with finishing the last book in a really great book series. It's like the last day at summer camp. You bid farewell to people you've become close to, knowing that you'll never see them again. I am not ready to bid farewell to Lady Alexia Maccon nee Tarabotti. 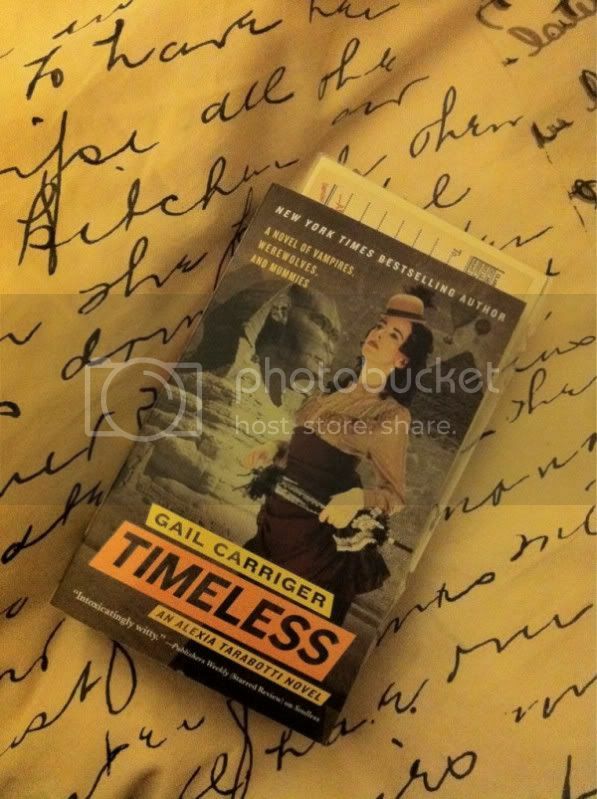 I received my copy of Gail Carriger's last Parasol Protectorate novel, Timeless, a few days ago and hurriedly dove right in. I tried to pace myself, knowing it was the last book, but I couldn't. I had it finished in under two days and was left teary eyed and sad. It was wonderful. It was everything I've come to love from Carriger's books. The dialog was frequently witty and hilarious, the characters fascinating and funny. I found myself at the edge of my seat many times and brought to tears at others. Readers, if you have not yet read these books, you must go do so immediately. No ifs, ands or buts. How can this wonderful series be over? I'm not ready! Timeless picks up three years after the end of the fourth book in the series, Heartless. Lady Maccon's daughter is running wild and it takes two households full of vampires, drones, werewolves and caretakers to keep a hold on her. Timeless acts as a good springboard for Lady Prudence Maccon, since Carriger's next series will be all about her. The entire book isn't all about Prudence, however. Her mother splits that honor with Biffy, the latest werewolf in the Woolsey Pack. I must say I was delighted by this, since Biffy is a huge favorite of mine. Lady Maccon is called to Egypt to have an audience with the world's oldest vampire. Going along for the ride are all the usual suspects; her husband, her atrocious hat-wearing friend Ivy and a troupe of actors being used as cover. Back home in London, Biffy and Professor Lyall try to solve a murder and take care of the pack. Chaos, as you can imagine, ensues. Simply put, this was an amazing novel. I loved every single page, every hilarious description, every witty turn of phrase and even every heartbreaking moment. I don't want to spoil everything, but it was just wonderful. Oh, Biffy and Professor Lyall! I could cry all over again! Oh, and the surprise "gift" Lord Maccon has for Lady Maccon at the end of the book... help, send tissues quick! I think the reason I was so emotional is that this book is the official last chapter for Lady Maccon and her compatriots. Timeless completes the series and it felt so final. I have so many questions left unanswered, so many things I want to see the characters do. I want to know their futures and if things really do work out. The last page is a bombshell, a twist even I didn't see coming, and I actually shouted "NO!" when I turned the page and realized it was all over. Thankfully, Carriger has said that the best part of writing immortal characters is that they can pop up again. Lord Akeldama is already hinted at appearing in the forthcoming Prudence series, and I am praying that Professor Lyall and Biffy do as well. Oh, Biffy and Professor Lyall! My heart breaks all over again! I'm so thankful I got to know these characters. I'm so glad I was able to tag along on their adventures, share in their joys and weep at their sorrows. I'm so happy and yet so sad at the same time. Just like that last day of summer camp, I don't want to go home yet. I want to stay with the Maccon's! Gail, congratulations on a brilliant series. Thank you from the bottom of my heart for Alexia, for Biffy and for Lord Akeldama. I wait, breathlessly, for the next series (while I keep my fingers crossed that some of my favorite immortals pop up every so often!). Oh nice! I just started the series! I had a chance to meet her this past weekend, she is awesome and truly a great speaker! I'm looking forward to reading this one! A very unique series. Glad that Biffy get his share of "facetime". I pre-ordered this what seems like ages ago. This morning I had an email from B&N letting me know it was ready for me on my Nook. I have lots to do tonight though so I cannot even touch my Nook until I am done. I know if I pick it up I won't put it down. Sorry to see this series end.